Michael Witmore. Photo by Chris Hartlove. This year the Folger is leading a nationwide celebration—The Wonder of Will—to celebrate the 400th anniversary of Shakespeare’s death, or better, the fifth century of his afterlife. Why do we keep returning to this writer? There are many answers to this question. One is that he belongs to no one, and so potentially everyone. From Bollywood film versions of the plays to productions in Kabul that challenge the separation of male and female actors, Shakespeare keeps speaking new languages. If you think about the many Americans who have turned to Shakespeare over the course of our nation’s history—Abraham Lincoln, Frederick Douglass, Emily Dickinson—you realize that Shakespeare’s American fortunes benefited from his not being born on this side of the Atlantic. Sometimes it’s easier to learn from a distant cousin than a close relation. The words made famous by this writer still sparkle, and that is another reason for his success. Shakespeare brought a quickness of mind and nimbleness of feeling to his writing: images, ideas, and possibilities move “swift as a shadow.” He was a master of the brilliantly far-fetched. I am reminded of the moment when Cesario, becoming frisky during his courtship of the Countess, says that “the babbling gossip of the air” is going to “cry out Olivia” (which is her name). Babbling gossip? Air? This is dare-devil word choice. Somehow the susurrating rush of water has become a spoken word, a call to attention. Shakespeare prods his listeners, getting them to see things and sense connections that we might miss. And that’s the point. Great language makes things that would otherwise have to be a miracle—speaking air!—seem as natural as falling rain. To this “let me count the ways” explanation of Shakespeare’s enduring appeal, I’ll end with a final reason: We still pay attention to Shakespeare because, no matter how networked our world becomes, he remains one of the ultimate connectors. In a sense, Shakespeare wrote the preamble to modern life. His stories reflect the tensions of the period in which he lived—a period that saw the rise of global trade, modern science, free speech, religious tolerance, even the media revolution that was the printed book. Shakespeare found the human heart in all of this change. Long before anyone knew what to call it, this clever man from Warwickshire was writing about the modern world. That world is still our world, and I invite you to encounter it anew this year as we celebrate The Wonder of Will around the country and here in Washington, DC. We’ll encourage you to think again about Shakespeare, but also about the questions and challenges we face today as human beings. We will never live in a safe and prosperous world until we learn more—much more—about what drives us. That really is the question. If we look only to markets, algorithms, and biology to show us the mysteries of the human heart, we will only get so far. We still need these powerful, adaptable, indispensable stories to teach us who we are. 400 years in, Shakespeare remains there for us; there for the taking. 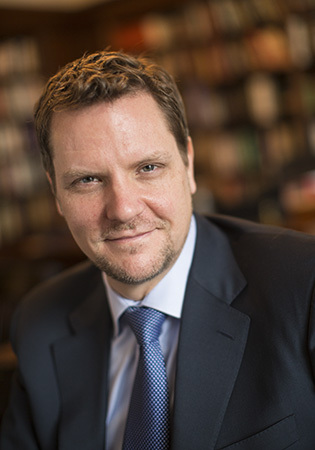 Michael Witmore is the director of the Folger Shakespeare Library in Washington, DC, and the organizer of The Wonder of Will: 400 years of Shakespeare. Folger Shakespeare Library is the world's largest Shakespeare collection, the ultimate resource for exploring Shakespeare and his world.